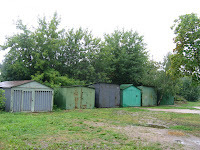 A Russian Garage: Not the garage you use in the USA! I am in the mood to let you see things of Russia and Moscow that you may not have ever seen before. In the USA people most likely think of a garage as being part of your home. Or maybe a free standing building that houses both cars and Dads other toys. 🙂 A building that is bigger than the flat I live in by a huge amount. In Russia the garage is different. It basically houses just the car. In fact so small that I am not sure how some people get out of their cars when they park them. These buildings can be found stuck in any free spot that you could imagine. 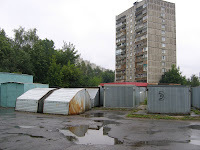 We all live in flats built during the CCCP era. So lack of parking space is the norm. Russians have become very creative in their garage placement. Where you find one garage you will see 10 other people try to fit their garage. 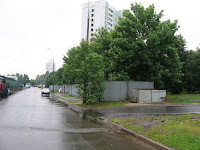 Russia during the era of the CCCP had parking garages also: as you can see in picture 4. 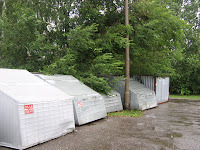 They are more a shed style and built on site by steel plate and welder. The new garages are prefab and bolted together on site, made out of sheet metal. Russians are amazing, they find a way to make life better, anyway they can! I am finding out do not tell a Russian,”You can not do that.” they will prove you wrong! !